Thanks to the Pan Am Games this summer, a large part of Toronto’s Port Lands have been developed and include housing for the athletes, which will be converted into condos once the games are over. 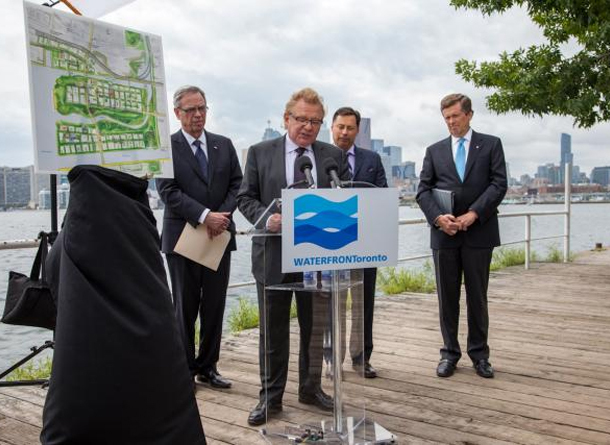 However, there are still large parts of the Port Lands that remain undeveloped, including the land the old Unilever plant sits on – just north of where the Gardiner exits onto the Lakeshore and the Don Valley Parkway. One of the issues is that it sits on a flood plain. Fixing this will require naturalizing of the mouth of the Don River, which according to Urban Toronto is currently concrete-channelled. It sounds like great news, but while Toronto Mayor John Tory announced $5 million to figure out if this will work, funding for the project is unsecured. While we have heard announcements like this before, between the revitalized Queens Quay and the West Don Lands work on the waterfront seems to be proceeding. If only we can convince city council to tear down the Gardiner!